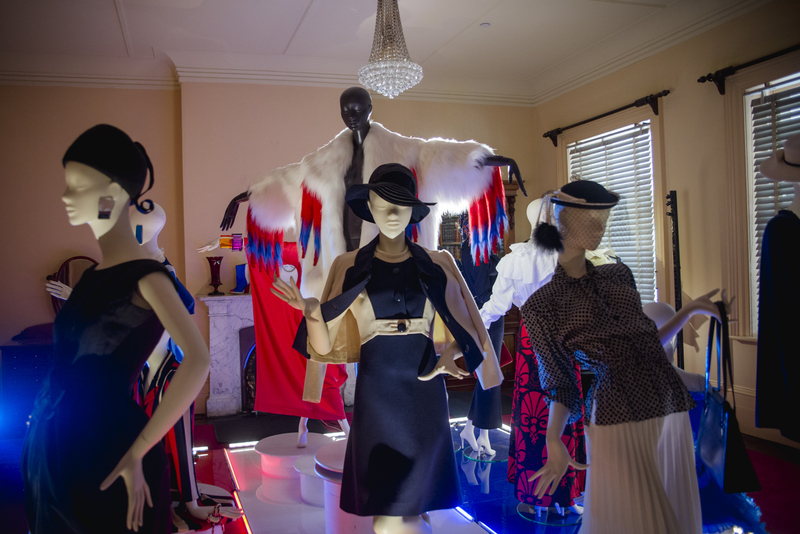 A fantasy of fashion, art, and social history appears in Como Fashion House at the National Trust of Victoria’s delightful South Yarra property, Como House and Garden. 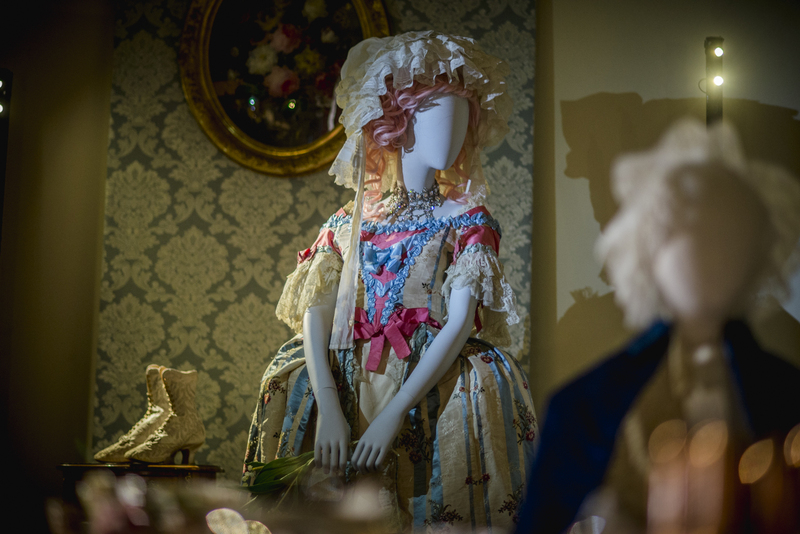 Four respected artists, stylists, and influencers make use of the site, the owning family’s history, the National Trust’s Costume and Object Collection, and stage two rooms across two levels for an ‘experience’ of vintage aesthetics and historical storytelling with a contemporary edge. The domestic interiors of the Armytage family are made into gallery spaces devoted to fashion and sensibility. This is a must see Melbourne trip down memory lane, with original clothing and accessories dating from the 1880s. 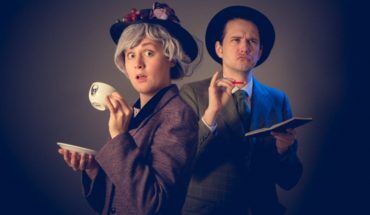 Music, video and original pieces situated in a majestic home tell a dramatic story of the Victorian era. Como House is picturesque. The wedding cake square-fronted house is trimmed with white wrought iron as petticoat with marble floors imported from Italy. Graceful grandeur is pre-eminent and, as you wander into this protected space, you enter a dream of life in another era. The narrative is visually enhanced by the artistic installations of Marc Wasiak,Thalea Michos-Vellis, Stuart Walford, and Kiri-Una Brito Meumann. Four is a good even number, offering variety, and each artist brings something different in perspective. I- t’s enjoyable to see unique approaches to the concept of art, fashion, adornment, image projection, and the stories we tell about our identities through aesthetics. Clothes date from 1880s the 1920s and ‘30s, through into the 1960s and 1990s, with some 2018 samples. If silk, linen, lace, organdie, embroidered netting, ostrich feathers, velvet, tulle, rabbit, leather and wool rock your world you are in for a passionate encounter. The Collection is breathtaking and in excellent condition. As you parade via each room, a video interview is relayed on a screen in central corridors, with the artists speaking about their approaches. The installations make you think actively about those who did inhabit its spaces, what constituted their daily lives, and you see evidence of the niceties- and repressed darknesses- of their world in the clothes. Wasiak’s Francophilia room is an over-the-top drama of elegance and the aspirational, which he later echoes in his Lumiere Room. In the dining room, it’s a treat for original artefacts such as 1890s French fashion magazines, audio samples of schoolgirl French (Mrs Armytage insisted her children speak only in la langue francaise at table) as well as a superb example of one of the Collection’s oldest pieces, a fancy dress a la Marie Antoinette, with its pink and baby blue ribbon work, flowing ruched taffeta and lace, and iron bustle the rival shape of the table’s jelly moulds. Original ladies boots accompany it. 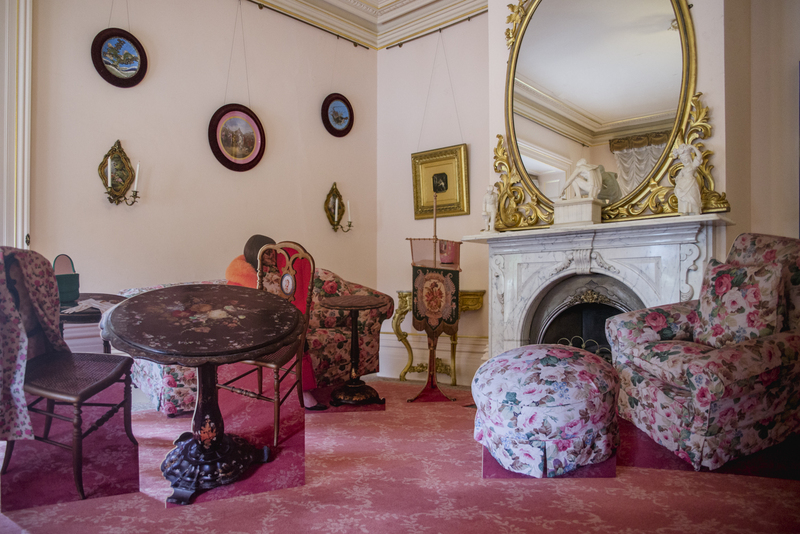 This room is artificially ‘feminine’ and a comment on the performance of identity given the house itself is situated close to the river the local tribes named Birrarung, the tough outdoor life of most Australian women of the era, and amongst the native flora of this distant colony. Stuart Walford’s Looking For The Untouchable room is dedicated to the life, and longings, of a servant girl. Heightened drama is emphatically coloured black & white, with gothic Victoriana the tone. Shadows of scary birdlike silhouettes are cast against the walls. A short film detailing her private dress up adventures is haunting and mystical. 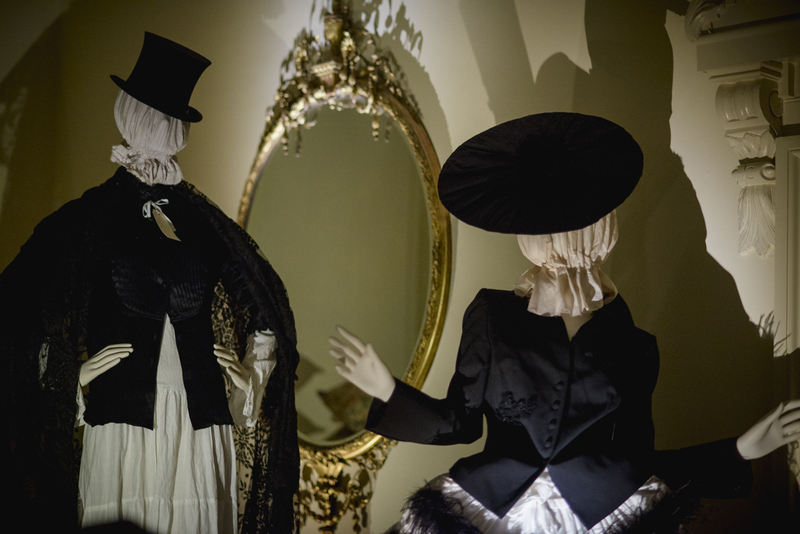 The room, with upturned creme iron beds amongst strewn mattresses is populated by a handful of mannequins, some standing, some seated, attired in original riding gear, hats, skirts, pants and jackets, with superb lace lingerie or feathered head wear. This room, enhanced by a doleful classical soundtrack on replay, is a total reverie and hard to tear yourself away from. Upstairs, are two big installations by Wasiak with generous donated dresses from Margaret Prendergast’s Ball And Chain Salon and The Vintage Clothing Shop. A large studio-sized room of retro 1960s fashion is the Tricoleur Room (the red, white and blue colours of the French national flag), and will have you gasping. Wonder round like a Mod Rocker and recall gear your grandmother sported as a young lass. 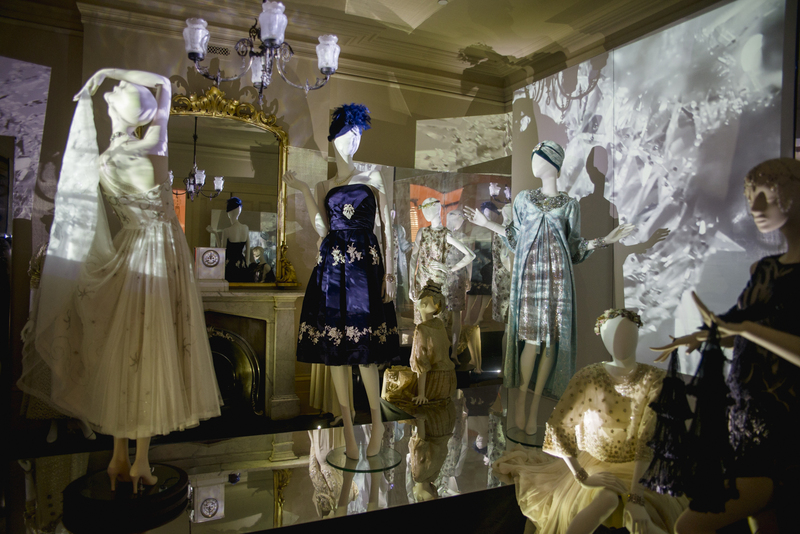 Adjoining it is his Salon De Lumiere, in glittering delight mimicking 1890s dressmaker Mrs. Eele’s Collins Street store where a room was lit by artificial light in order to show dresses off in evening light, as at the Parisian salons. A background audio track of tinkling glass, like a grand chandelier with it’s crystal teardrops, enhances the luxurious feel. 14 retro mannequins show in the room with one rotating. It’s beauty overload. A cute treat on your way back down is Walford’s Becoming The Heroine, dedicated to the needlewomen of such houses. This installation is found in sneaking up the slim staircase of the ‘between stairs'( Tweeney) housemaid, into her single bedroom halfway up the tower. The setting is evocative of isolation but inhabited by a statuesque mannequin in a 1930s French aristocratic fancy dress of feminine delight. Scrunched brown wrapping paper is stuffed into open drawers, and all about the room, simulating an air of chaotic disturbance of the certainties of the era and expectations of women’s roles. The exhibit is not all historic. Brito Meumann’s cardboard cutout furnishings of the pink ground floor drawing room are a cheeky glance back at a world of rigid class boundaries with the insouciance of our age, where an entire house can be produced from a printer. Michos-Vellis’ Freddie’s Room and her upstairs installation are very much commentaries and presentations of the modern, one about male ghosts that surveil women’s lives, the other a cool and off-beat, fresh take on the past which adds novelty to the mix. Walford’s After The Opera, set in a small children’s corridor, references the new technologies (photography) of the 1900s, enabling images of partly undressed young females to proliferate in private lives. Like Alice through the looking glass you will leave feeling transformed, fallen through a hole in the fabric of modern life to a world sans the digital, class mobility, and the pressured grind of our everyday lives. This is what art, and history, offers us. These artists take us from within the life of this building to question the very modes we assume in our living. Visit Como Fashion Quarter to experience this elegant enchantment. 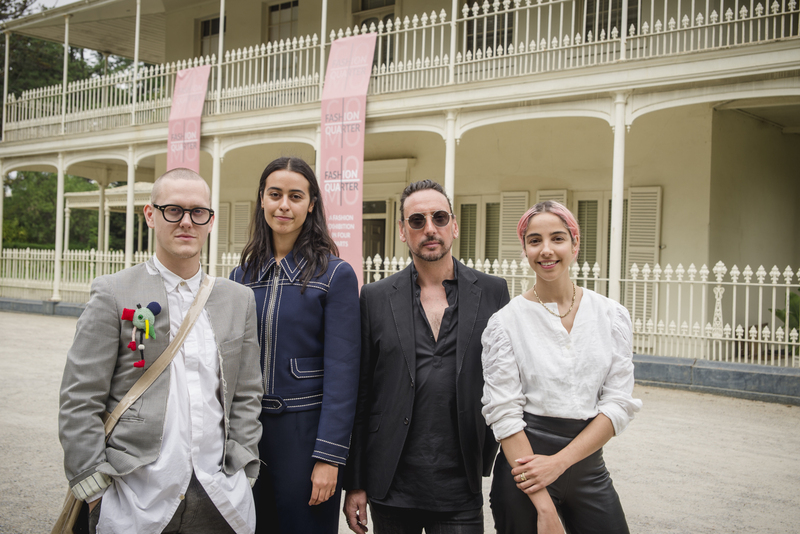 Como Fashion Quarter shows 6 April – 1 July, 10am – 4pm, daily, at Como House. 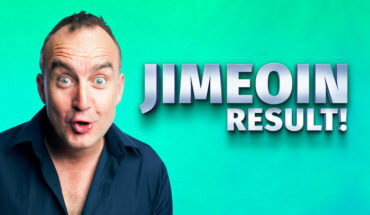 Book tickets here. Group bookings available(10+). The venue is not accessible. Follow The National Trust for future events across the range of their properties. Disclosure: The Plus Ones were guests of The National Trust of Australia(Victoria).. Image credit: The National Trust of Australia (Victoria).